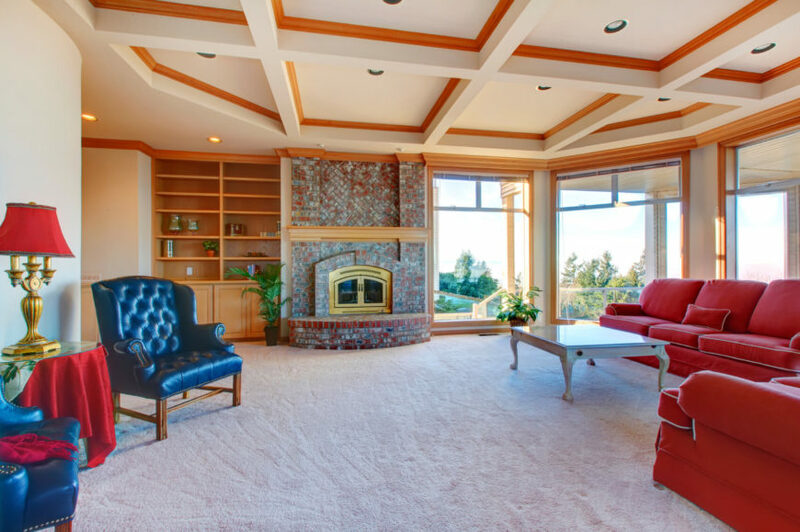 Welcome to our guide on living room ceilings! A commonly overlooked feature of your room is the ceiling. 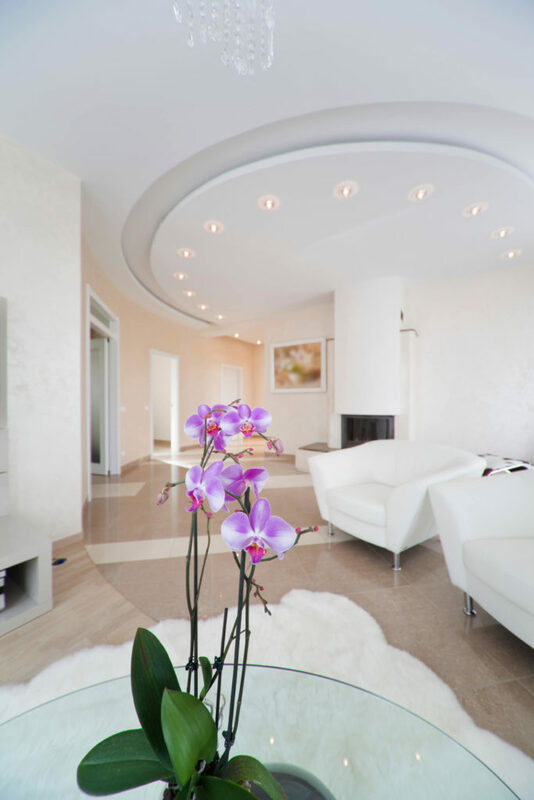 A custom ceiling can really accentuate the proper design. 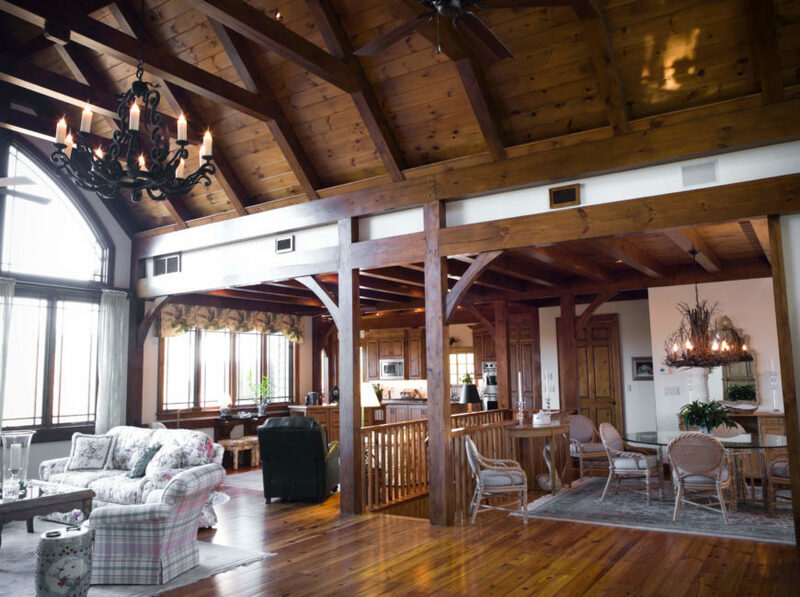 The natural wood colors and rugged look of an exposed beam ceiling works well with a rustic look, while an elegant dome is a perfect ceiling for a traditional design. 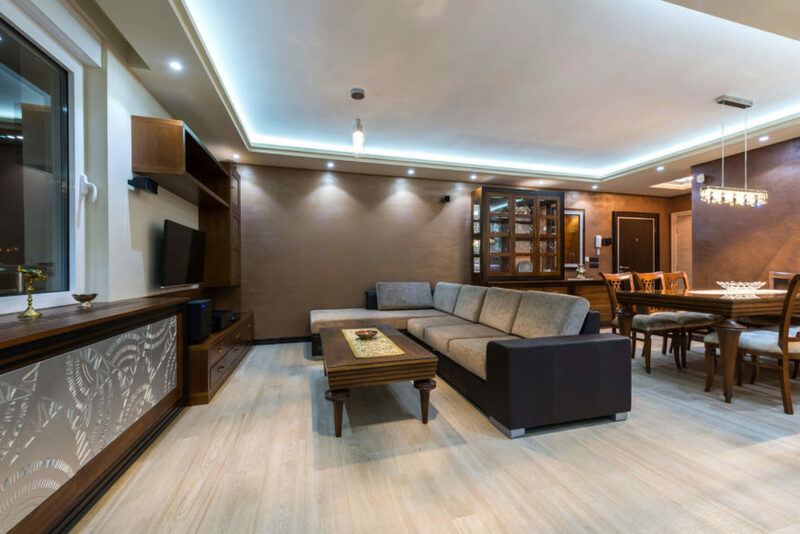 If you are looking to renovate your living room, consider updating your ceiling. And check out these great living room ceiling ideas! Want even more living room ideas? Check out our definitive guide to designing living rooms! 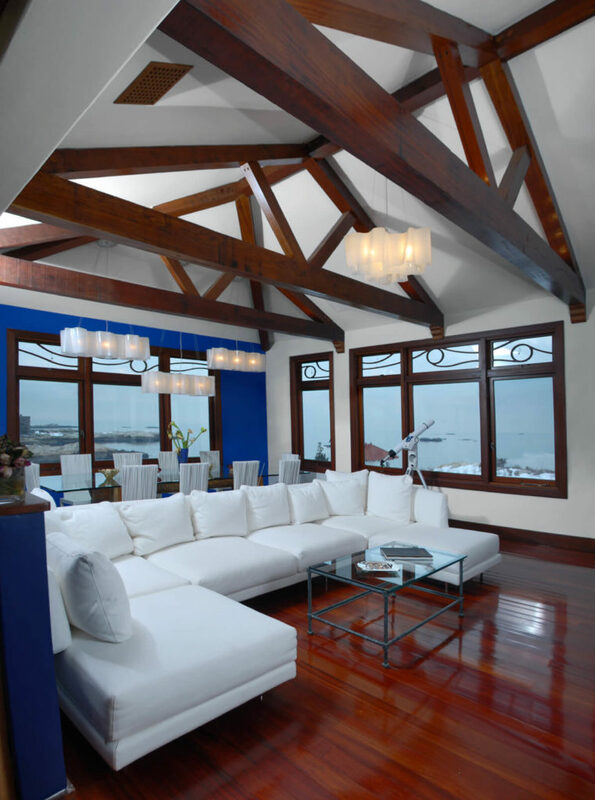 An exposed beam ceiling is an open and tall ceiling where the structural wooden beams can be seen. This style works well with many designs and is very versatile. 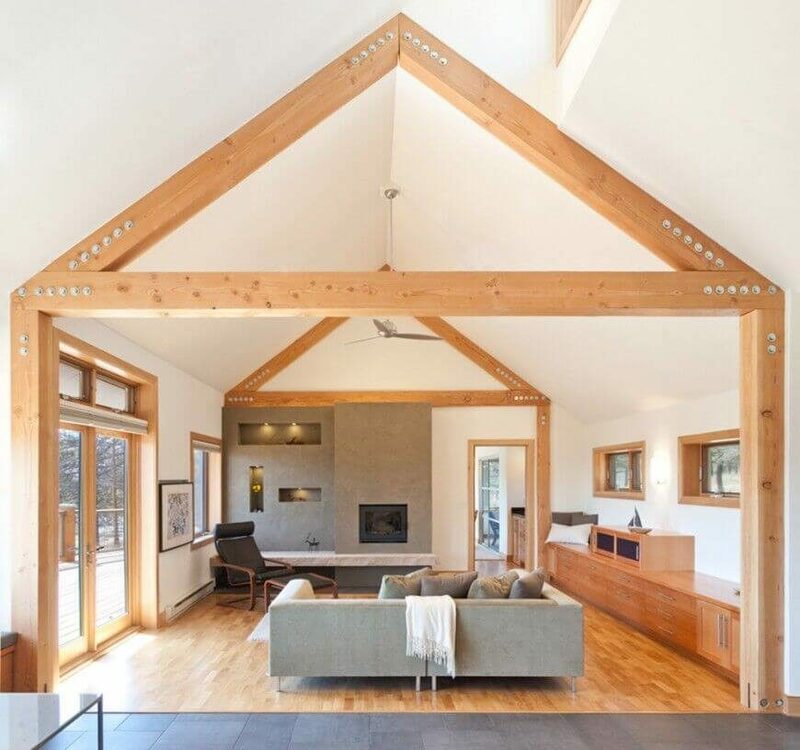 One of the biggest advantages of the exposed beam ceiling is that it helps reduce energy cost, and the versatility of exposed wood beams means you are not held to one style. You can make them work with a multitude of different options. An exposed beam ceiling look can vary in cost. 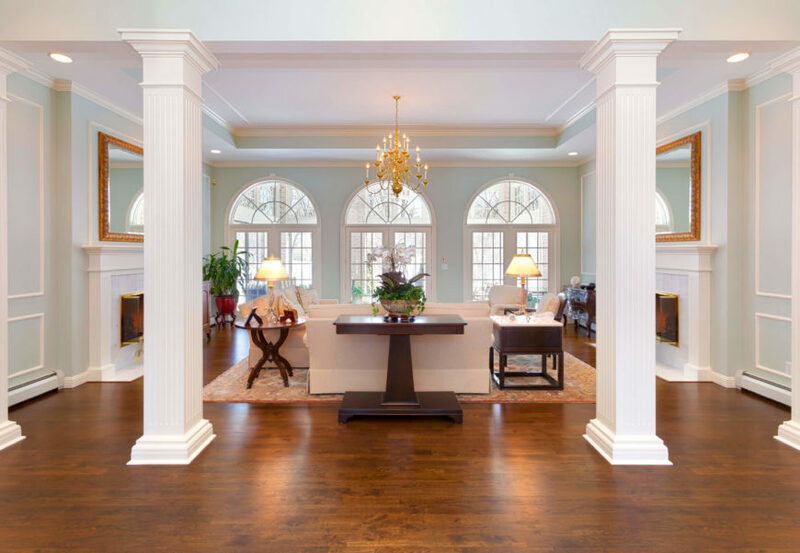 One of the factors that can change the cost of the ceiling is the number of beams. On average you can get 1 to 5 beams for around $482, 5-10 for $916, and 10-15 for $1,362. This ceiling has an interesting curved exposed beam design. 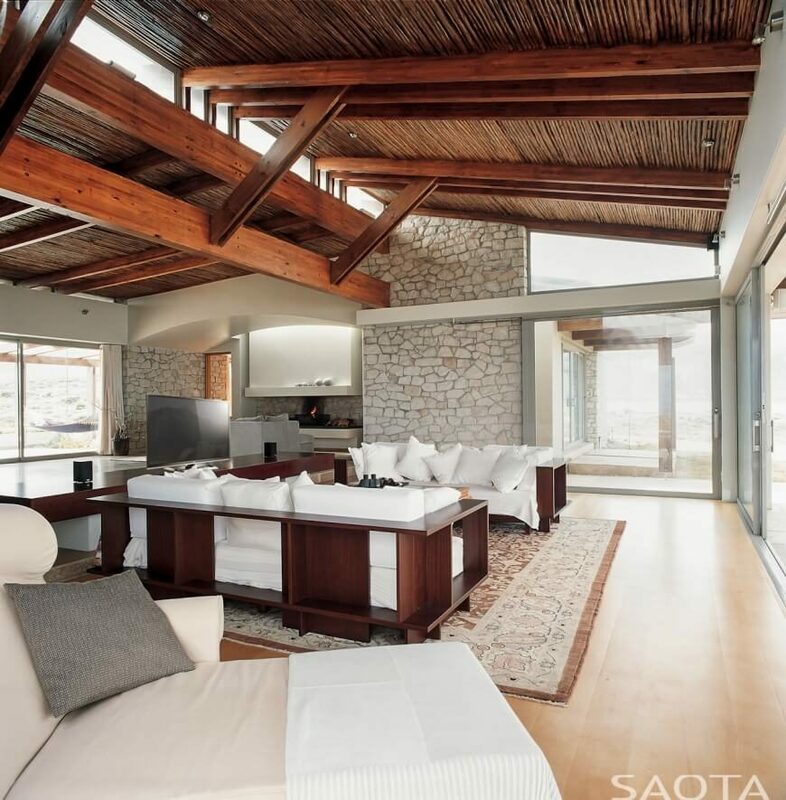 The room seems much larger with the height of these ceilings, and the exposed wood is finished and treated, which gives the room that extra bit of rich natural wood tones. A gorgeous contemporary living room with rich dark wooden exposed beams and incredible views through craftsman style windows. 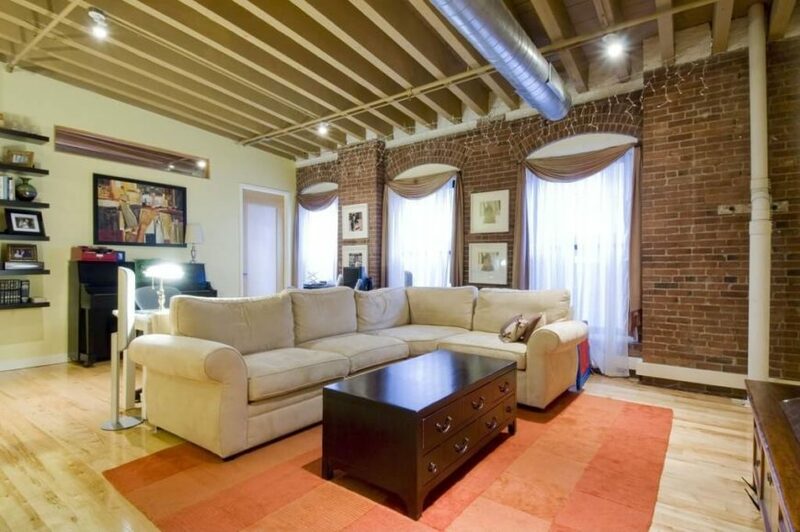 Here is a room with a stunning vaulted ceiling with exposed beams. This rich and layered ceiling not only adds some perceived space to the room, but also brings a rustic and rugged charm to the design. 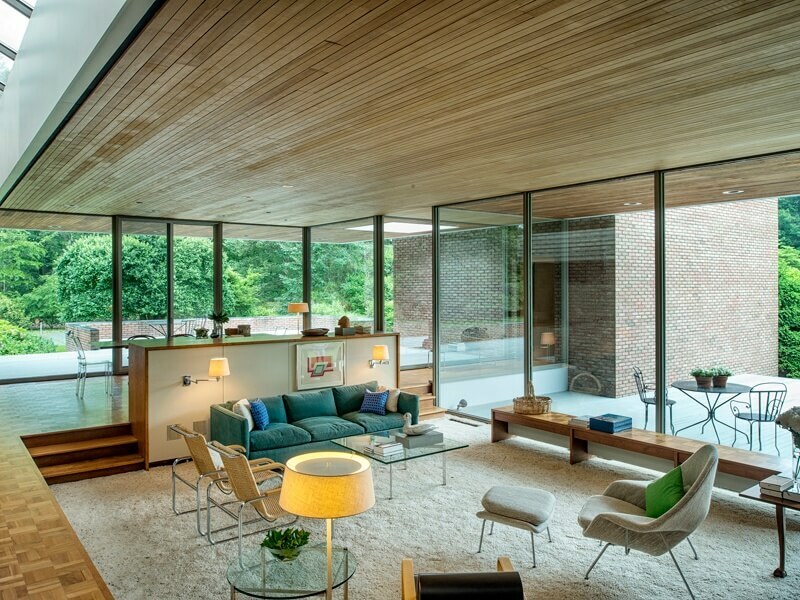 In this modern and simple living room, the exposed beam ceilings and masonry walls give an open and spacious appeal. 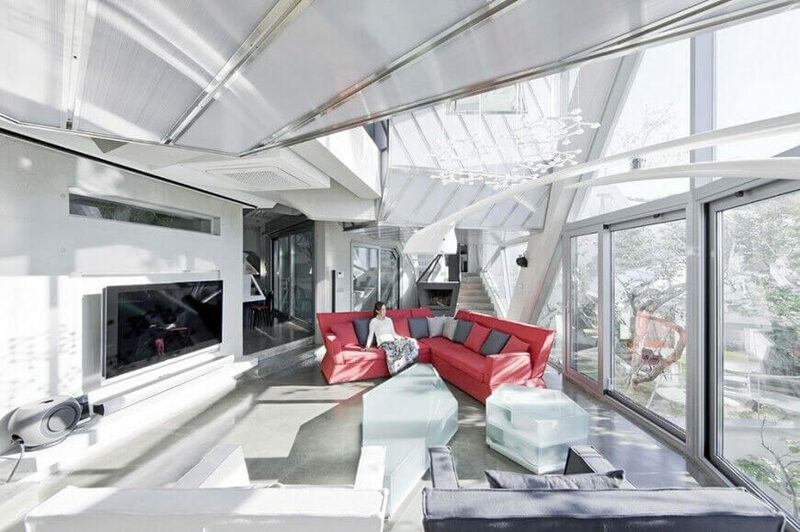 The skylights incorporated into the ceiling help funnel the light in, brightening the room. See more of this home here. Designed by SAOTA. 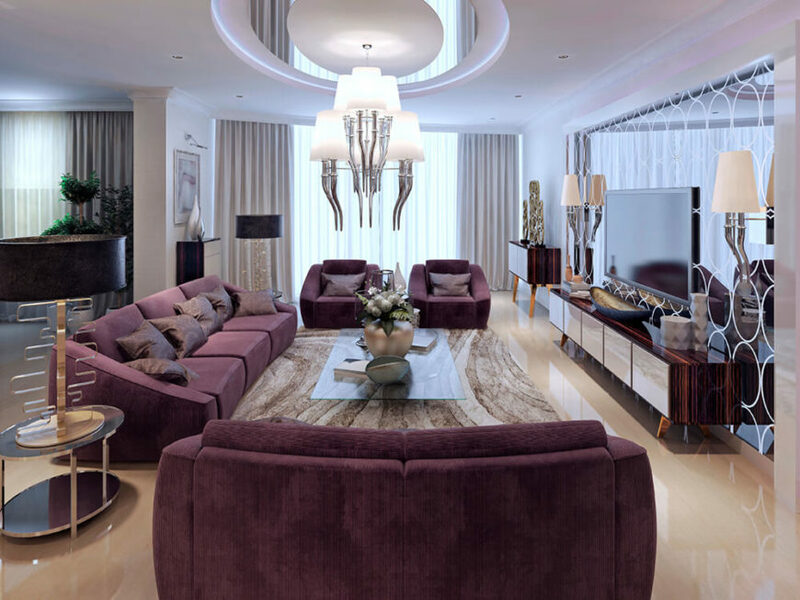 This living room is draped in rich brown tones and natural earth hues. 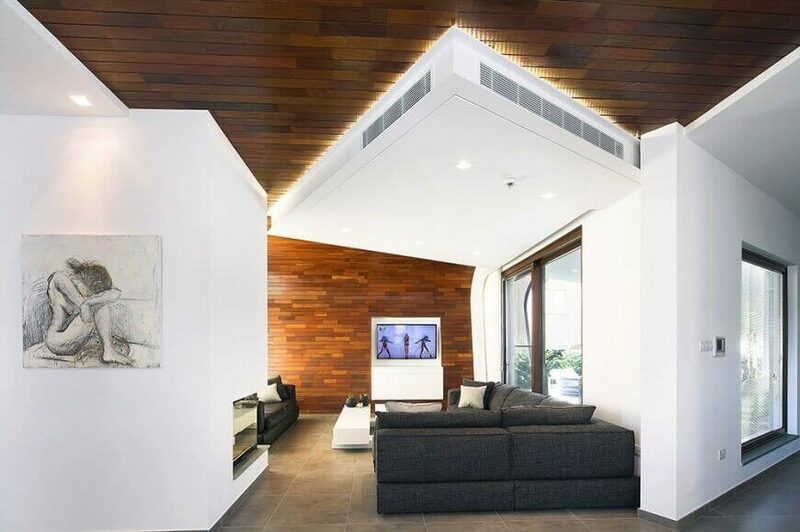 The exposed beam ceiling adds to this theme well, giving depth and texture to the design. See more of this home here. Designed by Red Rock Contractors. A tray ceiling is a ceiling that looks somewhat like an upside-down tray. The ceiling has a flat and slightly raised center, with the sides sloping downwards to meet the level of the rest of the ceiling. A big advantage to tray ceilings is that they tend to make a room feel larger than they really are, producing a grander and more spacious feel. There are also many different styles to choose from. 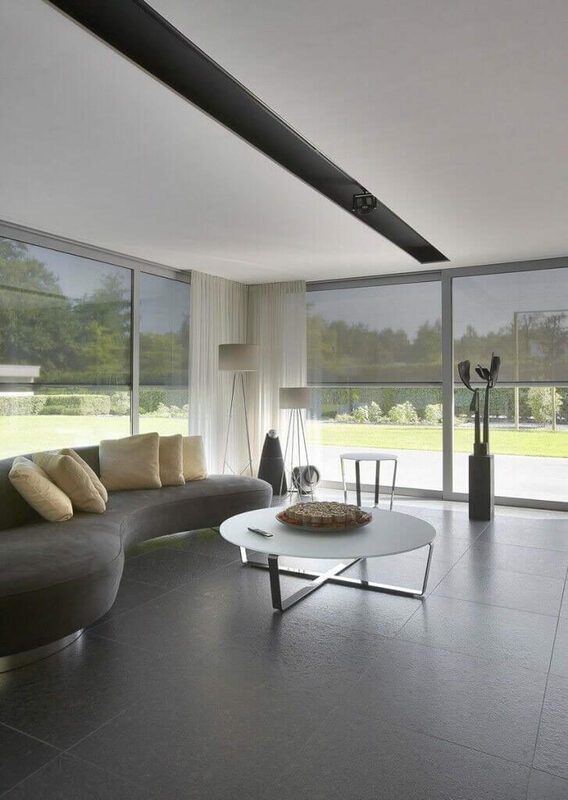 There are numerous kinds of tray ceilings, and you are sure to find a style that fits your design. 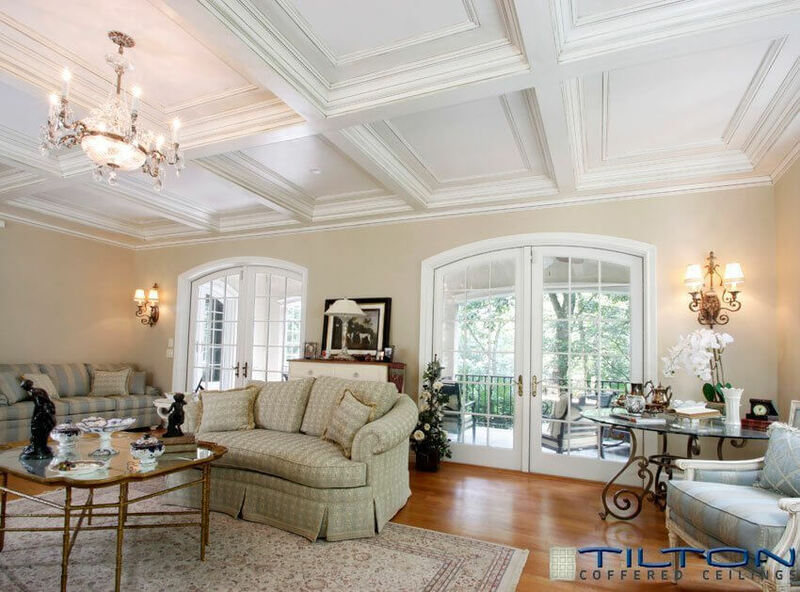 Tray ceilings are becoming more and more popular and are starting to become a typical feature of high-end homes. Installing them is a way to give your home a high-end appeal. On the downside, because tray ceilings are so specialized, they can be costly and are often only available for higher end or custom built homes. Here is a classic example of a tray ceiling. 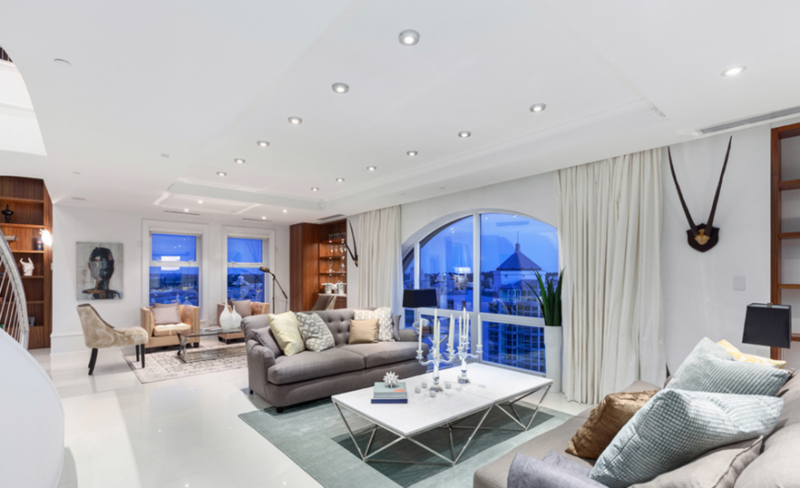 This option can make a room feel very classy, especially when paired with such elegant and interesting light fixtures. Here is a tray ceiling with carved ornamentation and a more rustic color. This makes the tray ceiling fit well other styles, including rustic and craftsman designs. 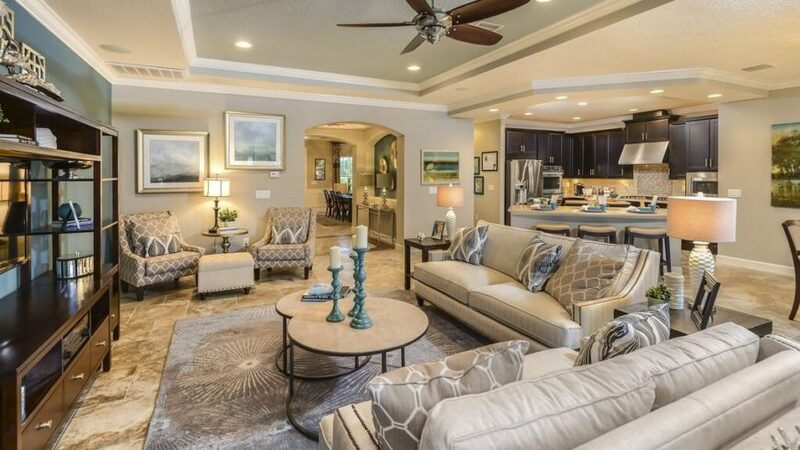 See more of this home here. Designed by CEILTRIM Inc. Here is a unique and lovely circular tray ceiling with a nice lighting element on the lower end of the tray. Not every tray ceiling has to have to have a large and rectangular tray. There are creative things you can do with this style. 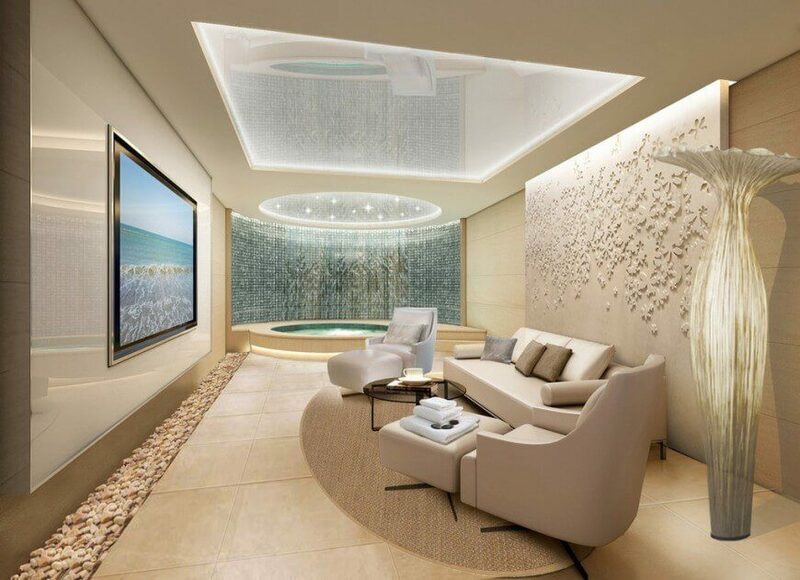 Here is a simple and uncomplicated tray ceiling with a modern design. This kind of tray ceiling can work with almost any style, from modern to traditional designs. Here is an interesting take on the tray ceiling, where there is a lighting element around the rim of the lower part of the tray to illuminate the top part, letting that reflect it and fill the area with light. This is a creative and modern option for a tray ceiling. 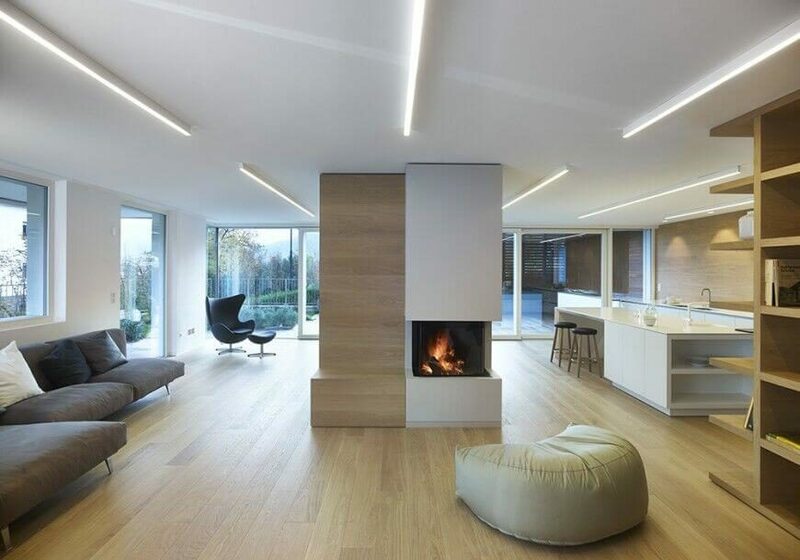 Here is a tray ceiling with lighting all along the recess, creating a great amount of lighting in this bright room. 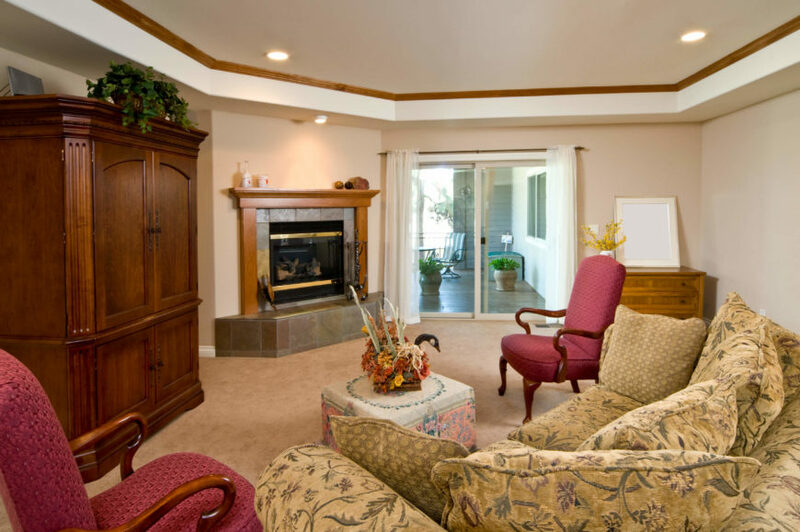 The extra space that the tray ceiling gives adds to the spacious and open feel of this living room. See more of this home here. Designed by Ben Amzaleg. A vaulted ceiling is a tall and arched ceiling. It provides a great high-end appeal and gives a room a great sense of space and openness. 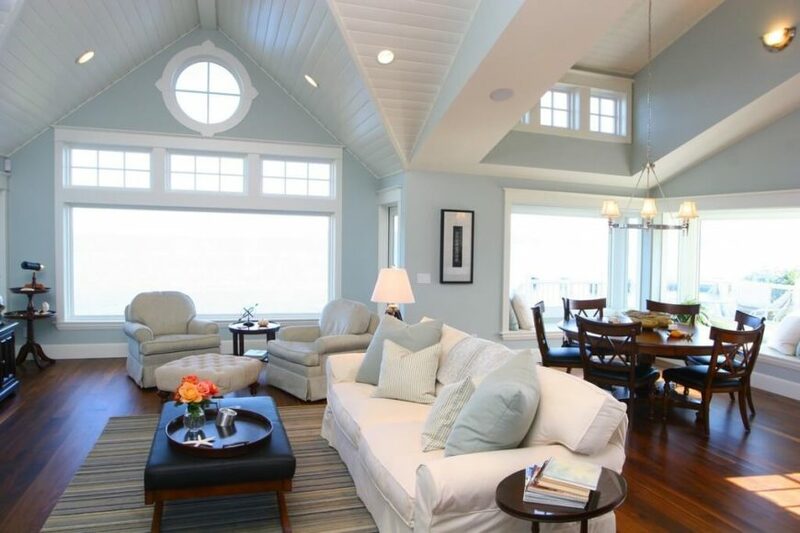 Vaulted ceilings create a very large and airy feel to a space. They tend to make a space appear far larger than it really is. They also tend to let in a great deal of natural light. 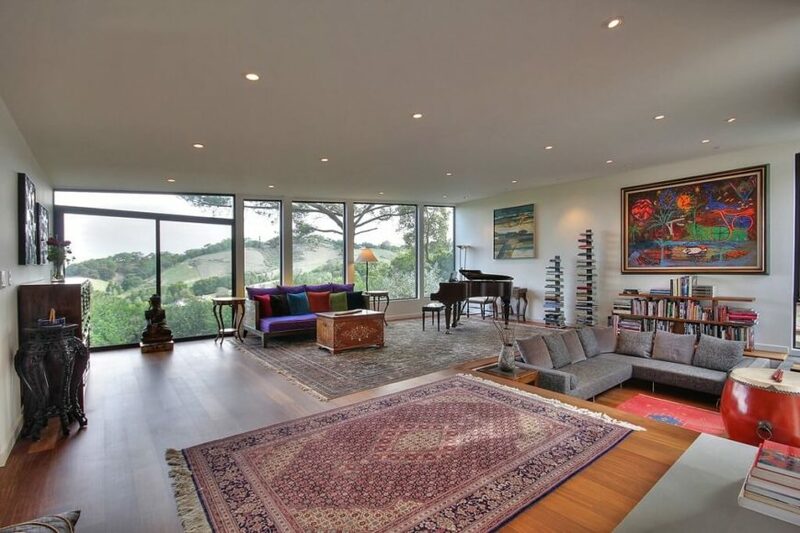 This is because higher and wider ceilings allow you to have taller and more expansive windows. Vaulted ceilings provide a great deal of extra visual interest to your room, giving added appeal where a standard ceiling does not. 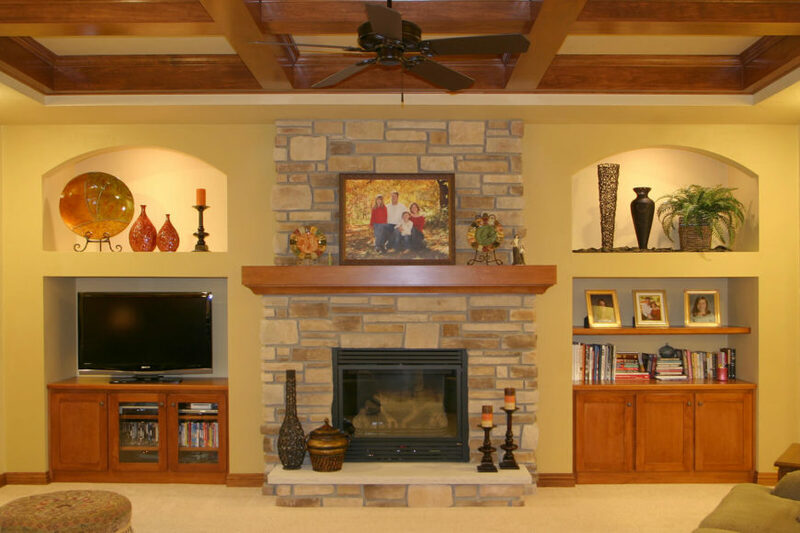 This is an example of a vaulted ceiling with some lovely natural colored exposed beam work. This ceiling along with the clutter free and simple design makes this room feel very open and spacious. See more of this home here. Designed by Barrett Studio Architects. 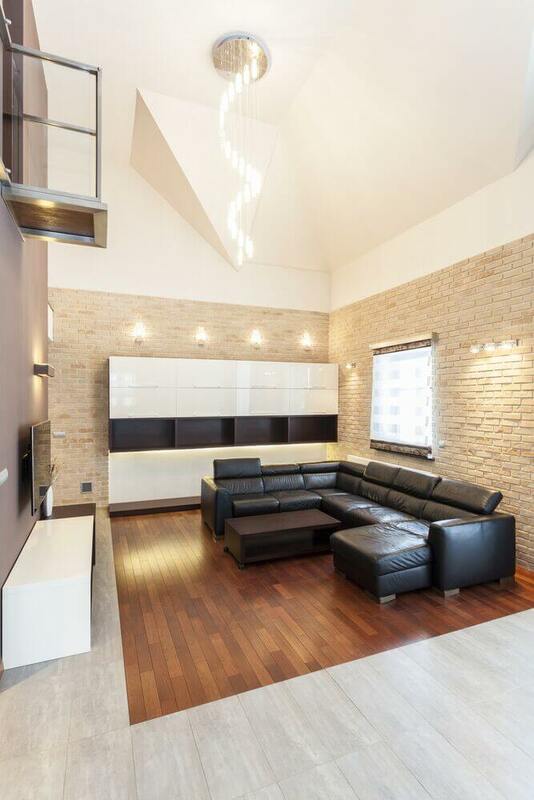 This living room is very simple and modern. The simple and uncluttered room is accentuated by a bright vaulted ceiling. 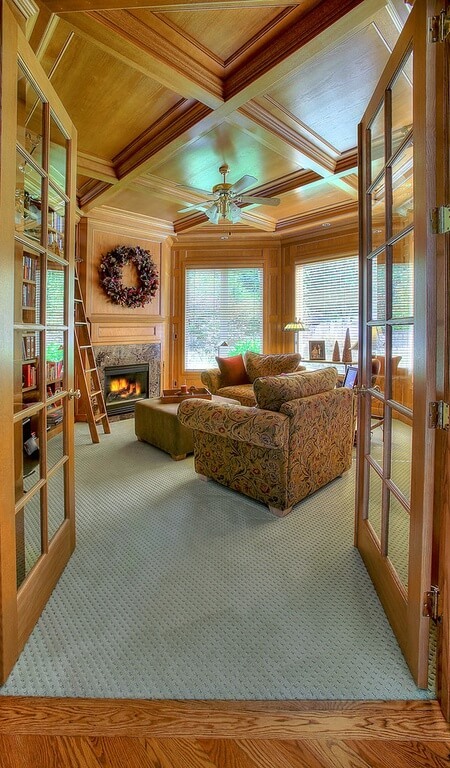 Here is a stunning wood paneled vaulted ceiling over a modern and simple living room. This combination of ceiling and design makes this room feel very spacious and open. See more of this home here. Designed by Ofist. 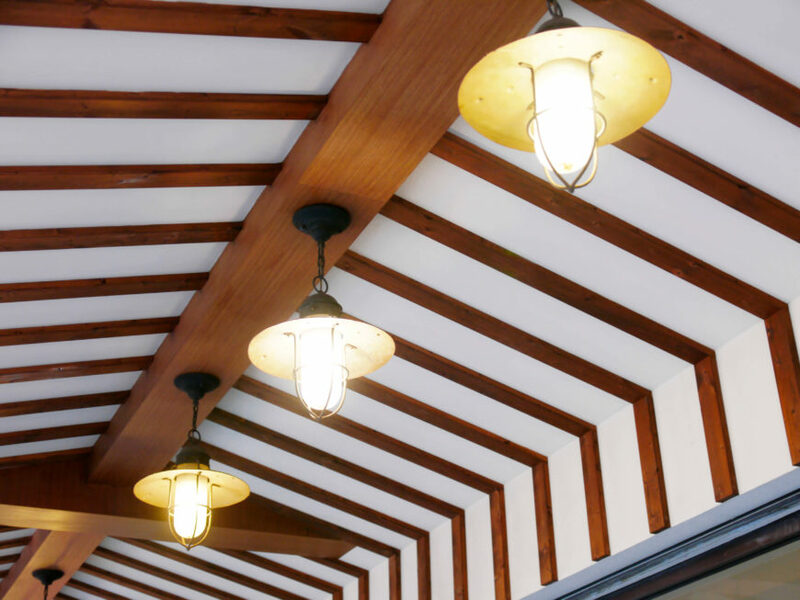 Here is a vaulted ceiling with a wooden design element that provides a extra visual appeal. The height of the ceiling lets the pendant lighting hang and not intrude into the space of the room. This living room has a classic, elegant, and sophisticated design that is both high-end and comfortable, reminiscent of private clubs. The vaulted ceiling adds to this style, giving space while also keeping the tones warm and personal. Here is a room with a vaulted ceiling that has curved edges. This style of vaulted ceiling has a high end appeal. See more of this home here. Designed by CEILTRIM Inc. 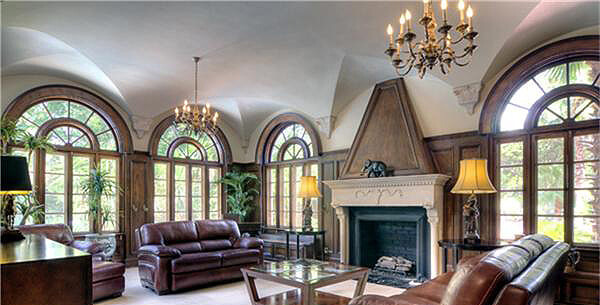 Vaulted ceilings don’t have to have a vintage look or hearken back to the cathedral style ceilings that inspired them. 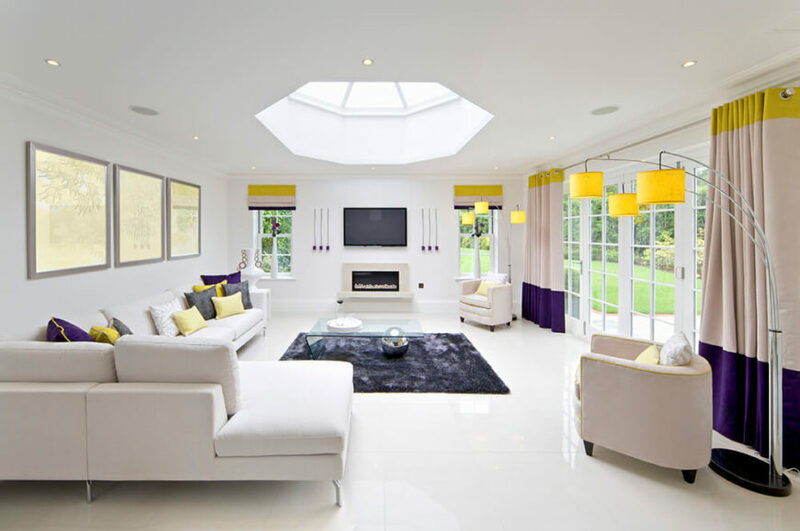 A vaulted ceiling can be very simple, modern and fit nearly any style. 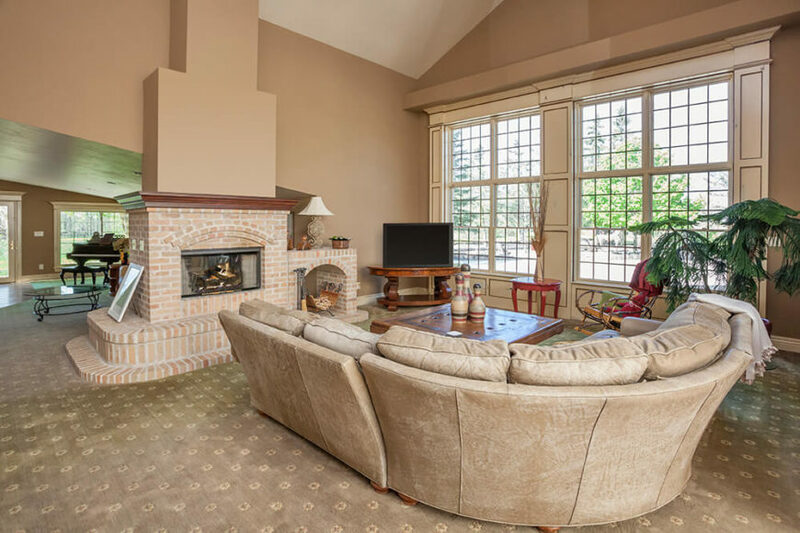 They may cut down on the cozy factor, but they add a greater sense of space, so your living room does not ever feel compact of claustrophobic. Here is an interesting vaulted ceiling with stained glass lighting fixtures. These features add to the cathedral appeal that vaulted ceilings can sometimes provide. This ceiling has a shallow barrel vault and is made of brick, rather than the typical materials used in a vaulted ceiling. This give this space a more raw and industrial appeal. It is a unique and interesting design choice. 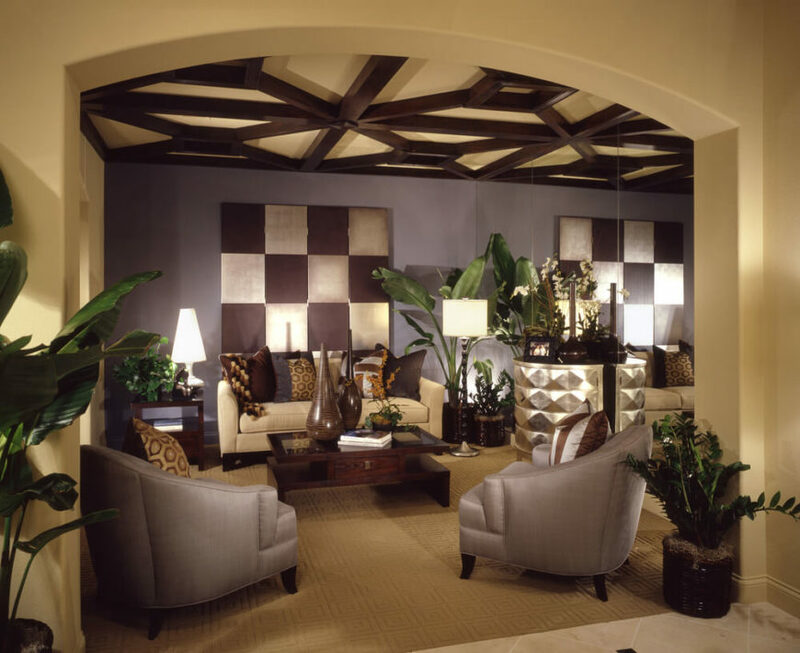 Coffered ceilings are made from a number of sunken panels. These panels are typically square, rectangular, or octagonal, and are called caissons. 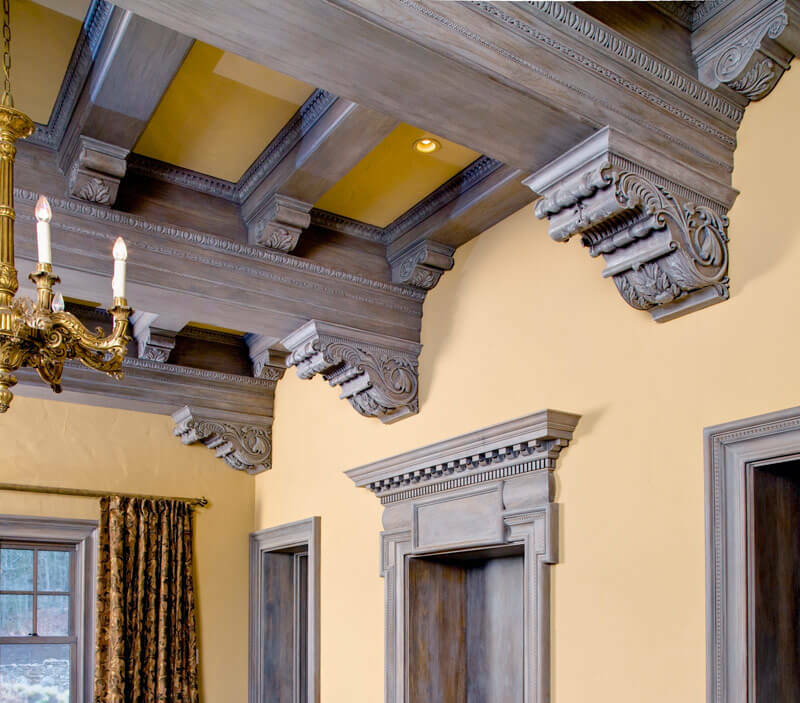 The sections between these panels can be ceiling beams, carvings, or simply ornamental. 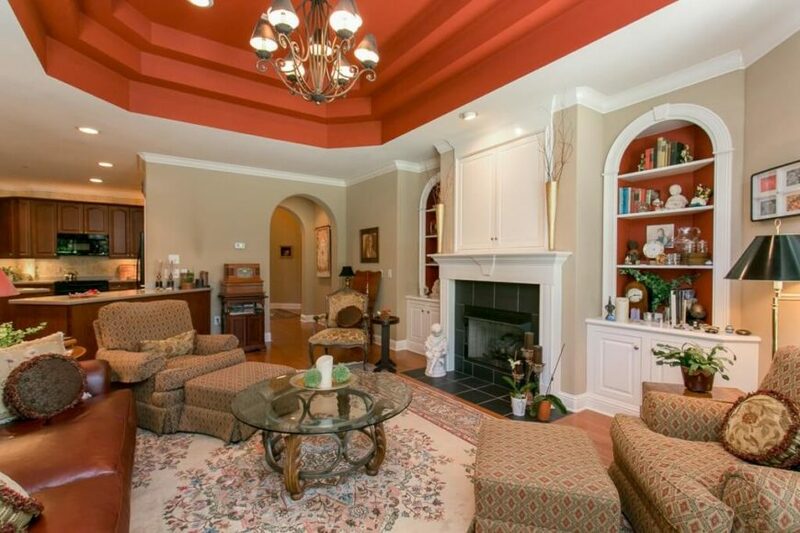 This very detailed and elegant ceiling has a coffered ceiling with finely crafted adornments. These give this room a very elevated and high end look. These kinds of elements are best if they are hand crafted, so that you know that they are quality and last for some time. See more of this home here. Designed by CEILTRIM Inc. 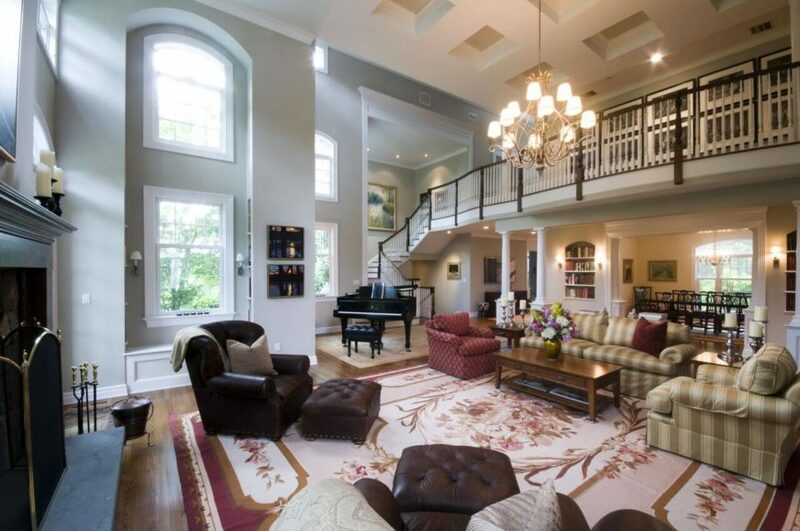 This living room has a nice example of a coffered ceiling, with a stunning chandelier over the main seating area. This design is sophisticated and brings an elegance to the design. 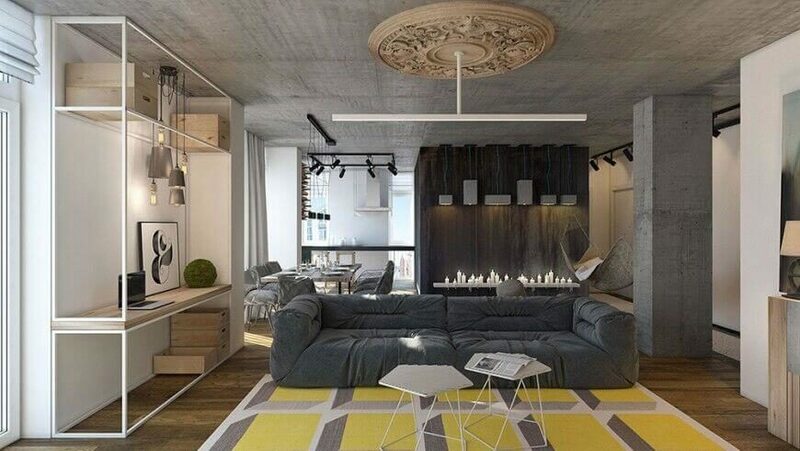 This living room is designed perfectly to fit with this ceiling. See more of this home here. Designed by CEILTRIM Inc. Here is a very high coffered ceiling with small panels and thick beams between. This coffered ceiling is simple, without much ornamentation, which works well with a wide open, clean, and natural lit living room. 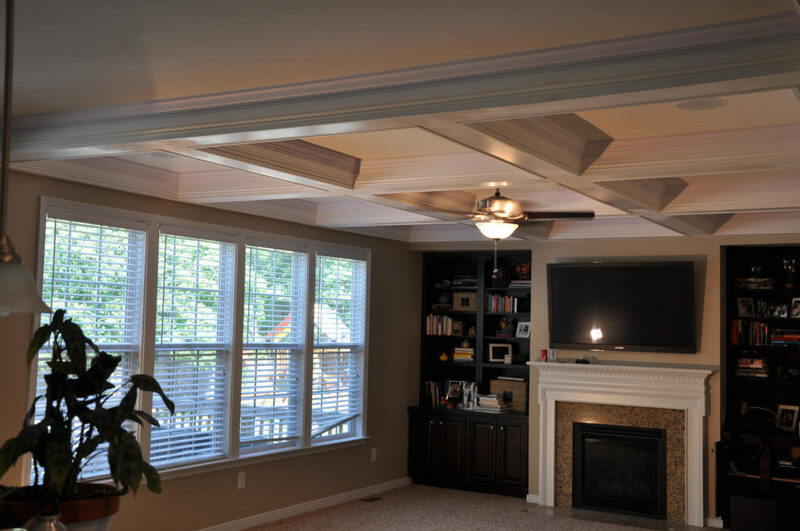 This coffered ceiling has a accent color highlighting the shape and design of the style. This kind of accent color is great for tying your ceiling into your color palette or drawing attention to the design of the ceiling. A domed ceiling is a ceiling with a tall dome in the center. This type of ceiling is typically a high-end feature, found in many different kinds of buildings. 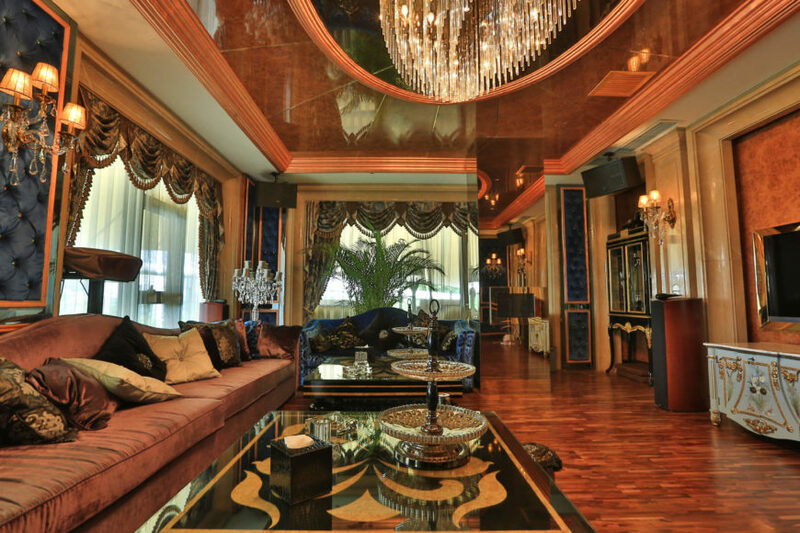 It can give a living room a truly elegant look. Domes add a very luxurious look to your room, and make the space feel larger. They can also play with your lighting well, giving you more lighting options. 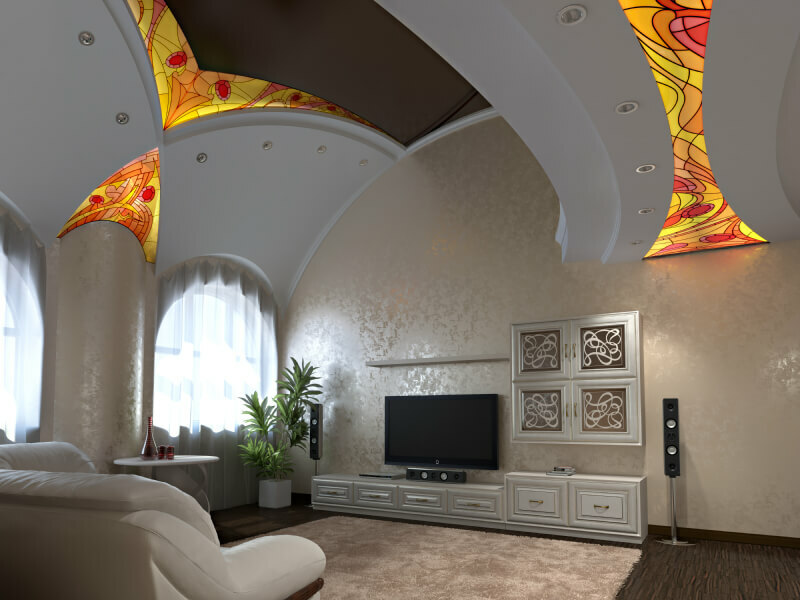 Domed ceilings can be quite expensive and this cost can be prohibitive to many. 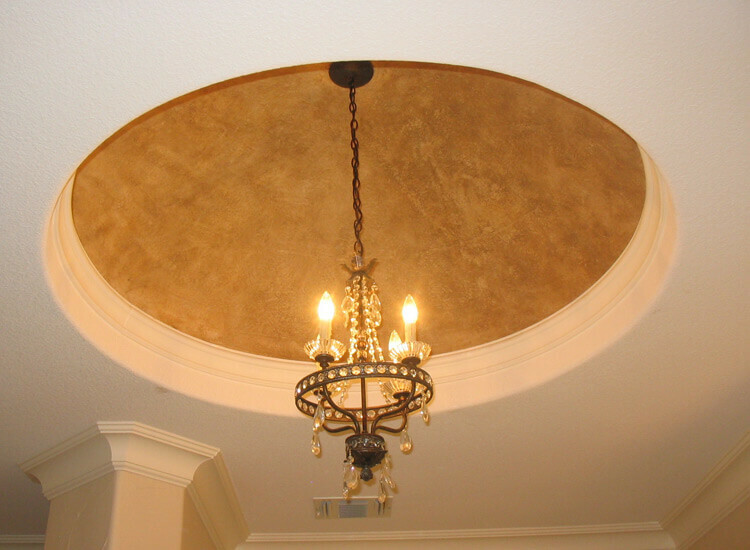 A domed ceiling also requires a lot of space that the typical homeowner may not have. 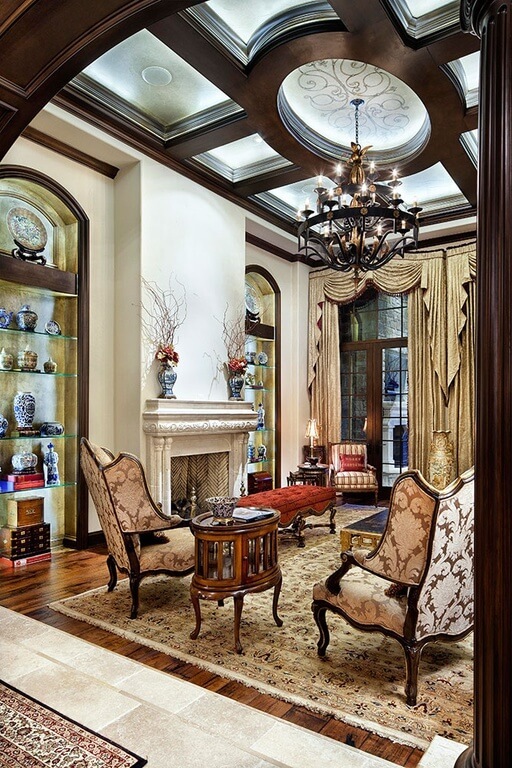 Here is a high end, elegant and interesting domed ceiling with a beautiful chandelier. 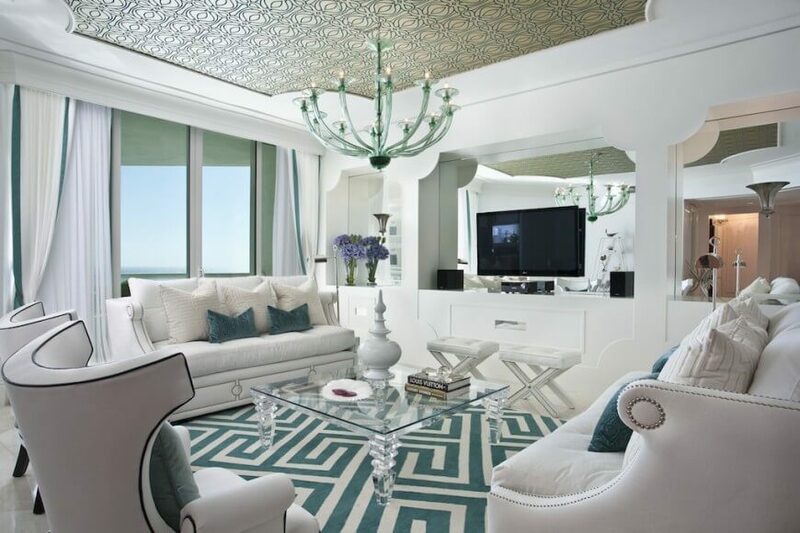 This ceiling works well with the high end, sophisticated, and finished look of the rest of the design. 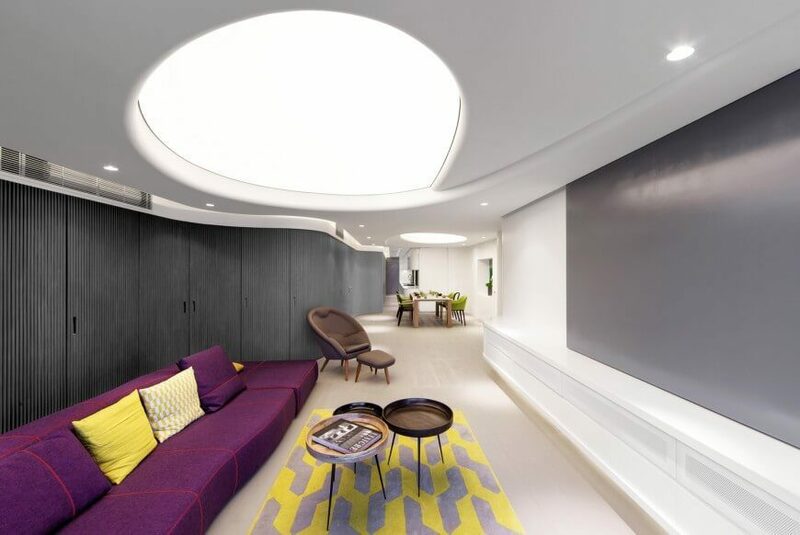 This modern and sleek living room has a brightly lit dome. 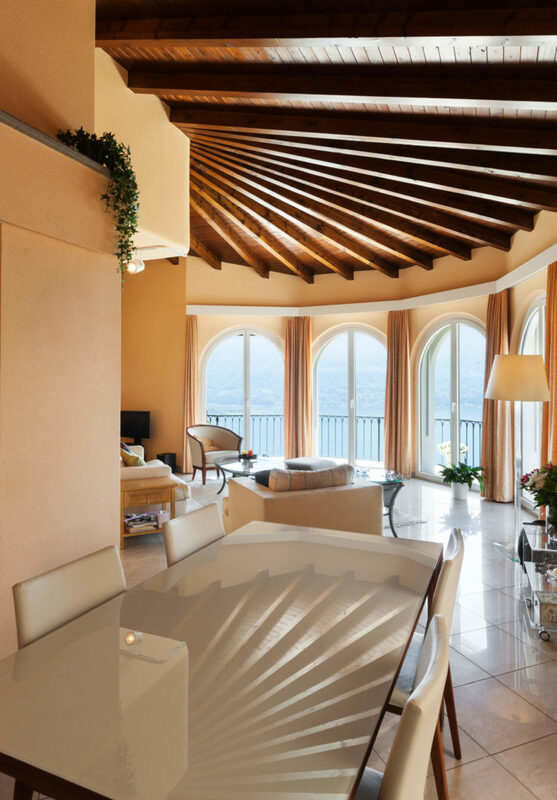 This dome acts as an amazing light well which can illuminate the entire room. The light reflected is very soft, as direct light can sometimes be harsh. See more of this home here. Designed by NC Design & Architecture. A dome is a great place to hang a chandelier. In this picture, a dome holds a low hanging lighting fixture. A dome can make a room seem larger and more spacious. See more of this collection here. 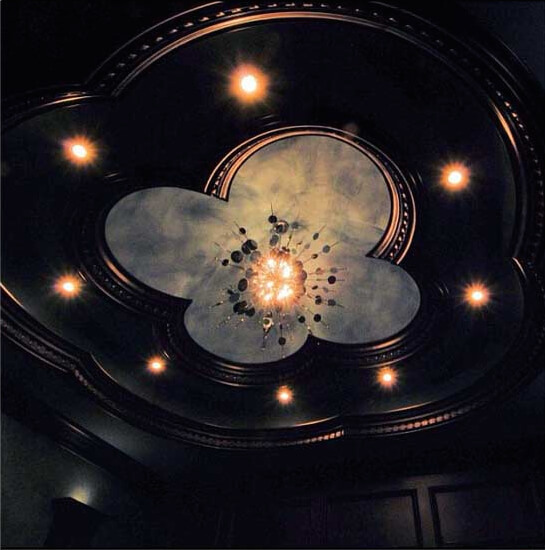 Designed by CEILTRIM, Inc.
An elegant and sophisticated chandelier hangs from a bright dome with a design in this picture. With brighter colors in a dome, light can reflect the light that shines up back down into the room. See more of this collection here. 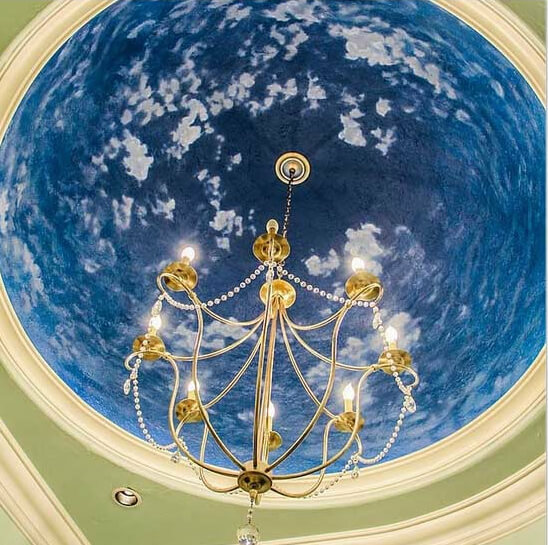 Designed by CEILTRIM, Inc.
A bit of art on the inside of a dome is a great idea. 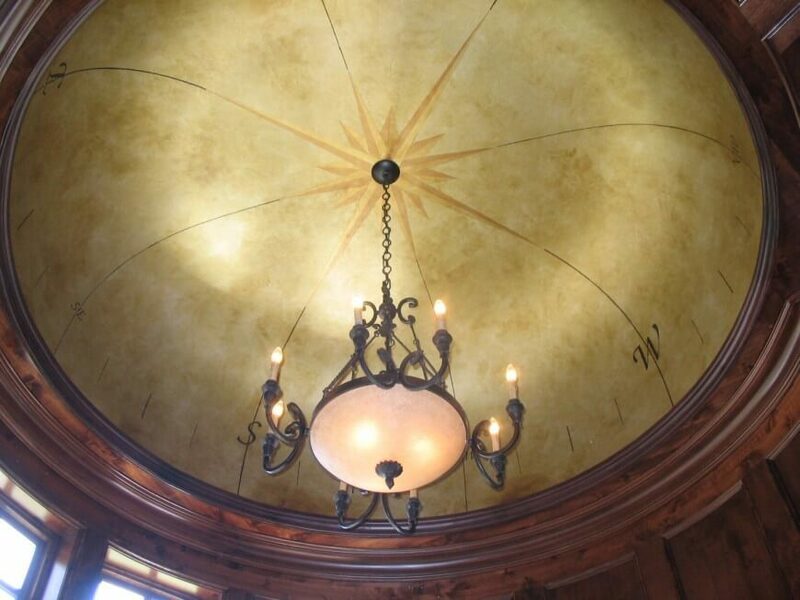 This dome is decorated with a compass rose in a rich sepia tone, giving this dome am antique and vintage look. See more of this collection here. 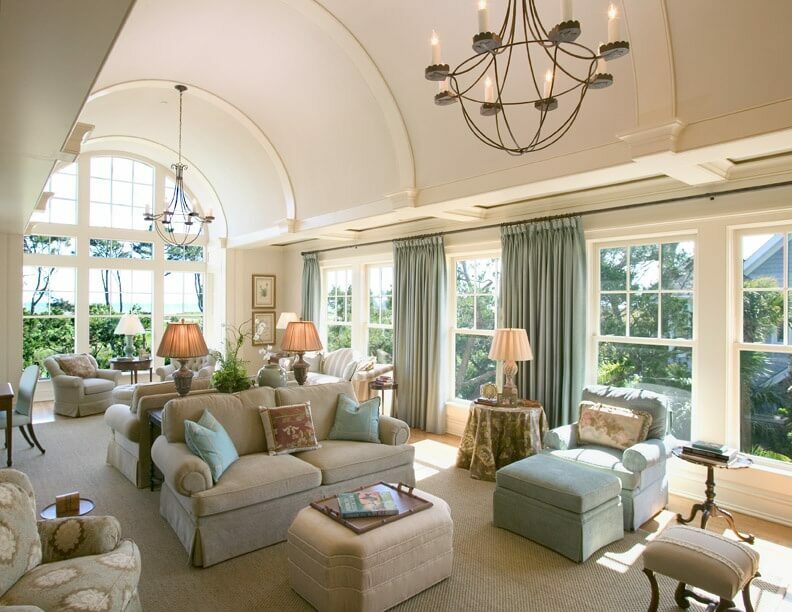 Designed by CEILTRIM, Inc.
A dome can give a room a very high end and elegant look. With elegant carvings, and adornments, as well as a chandelier, the domed ceiling can elevate a room and increase the sophistication. See more of this collection here. Designed by CEILTRIM, Inc.
A dome can be an interesting place for skylights. Skylights allow ample light to enter through the ceiling and a dome can increase the range that the skylights have. 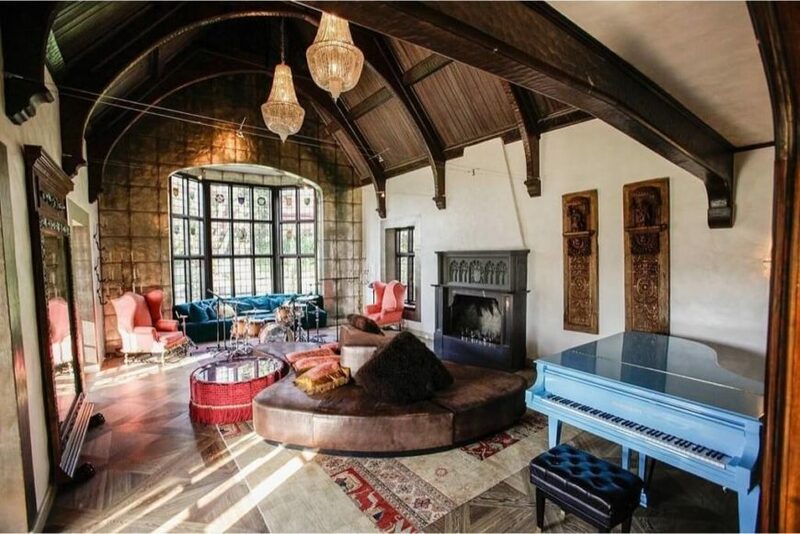 This living room has a small and elegant dome, with a chandelier hanging down out of it. A dome provides a place for lighting elements to hang, and can reflect the light that shines up back down. 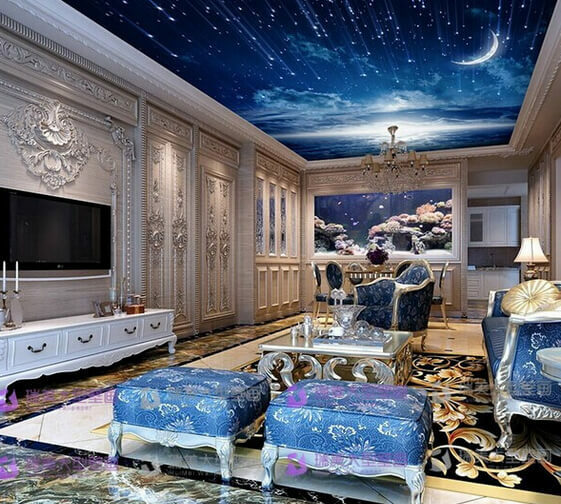 If you are looking for an interesting and unique ceiling idea, you can go for a photo ceiling. A photo ceiling is a ceiling with a high end design, typically some kind of art or photograph. 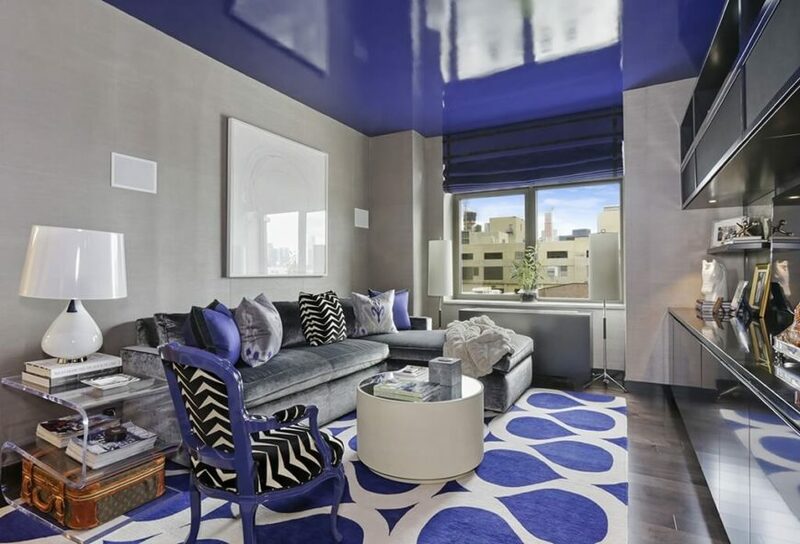 These kinds of ceilings are great when you are trying to match your ceiling to a particular color palette, or design. If you have a bit of art that you want to be a centerpiece of your room, there are lots of places to put it, and the ceiling is one of them. This ceiling is designed to tie into the color of the rest of the room. With this ceiling’s color, it sets the stage for the rest of the palette so that the entire room is cohesive and unified. See more of this home here. Designed by DKOR Interiors. The right photo ceiling can make your room feel wider. Nothing represents openness and freedom like the blue sky. In a room where natural lighting can be an issue, a blue sky photo ceiling can create the illusion of natural light. See more of this collection here. Designed by CEILTRIM, Inc. Here is a photo ceiling with a stunning night time sky scene. The art ties into the rest of the design and continues this theme into wall art and into the rest of the color palette. See more of this collection here. Designed by CEILTRIM, Inc. Depending on your home there are many unique things you can do with your ceiling. If you don’t have the space for a vaulted ceiling, or if you have a unique and interesting idea, don’t be afraid to think outside of the box. 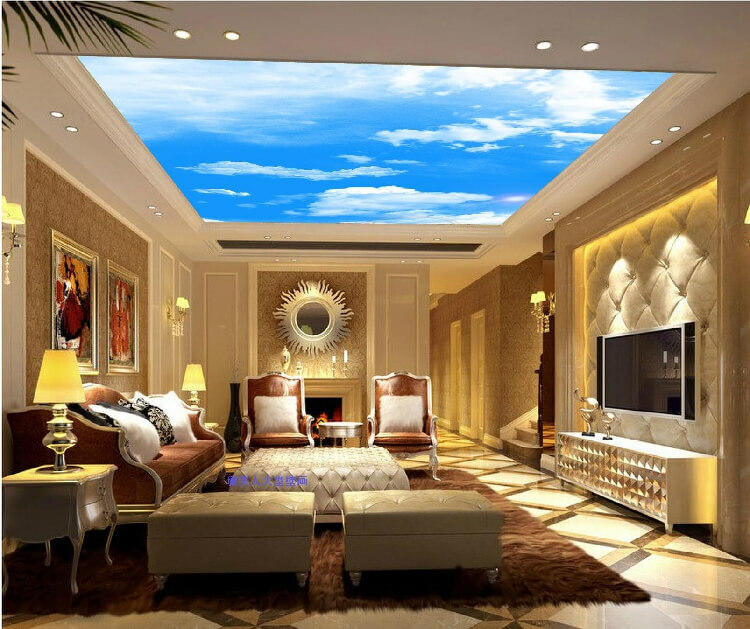 If you are fortunate enough to live in a space that can manage it, a skylight ceiling is a wonderful and unique option. 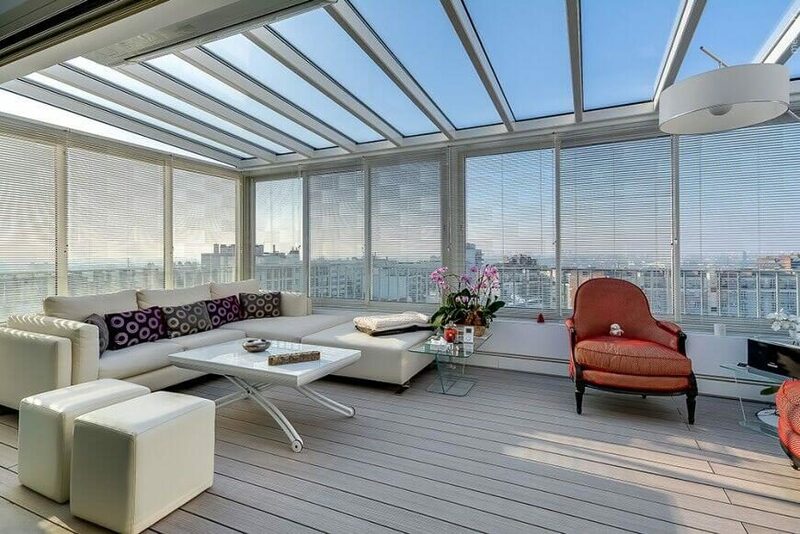 This allows for unparalleled natural light to make its way into your living room. See more of this home here. Designed by Manuel Sequeira Architectes. Here is an interesting ceiling with reflective glass and metal. There are also multiple levels and layers to the ceiling. This creates a visually interesting and dynamic ceiling. See more of this home here. Designed by IROJE KHM Architects. Here is an interesting ceiling with wooden planks. 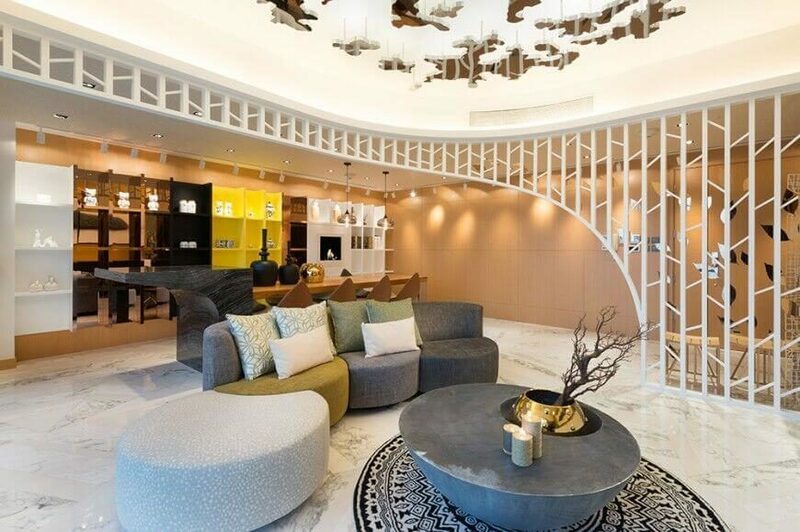 The ceiling curves into the wall giving the room a unique and interesting look. See more of this home here. Designed by Tsikkinis Architecture.